Rainbow Super Polymers an ISO 9001-2000 Company , set up 1st unit of PVC profiles for Doors, Partitions, Wall Panellings and Pre Fab houses e.t.c in the year 2000-01. PVC profiles is environment friendly material because they provide good substitute to wood and thus help a lot in maintaining ecological balance of nature. Keeping the same lines in mind and after having made remarkable presence in the market of PVC profiles now we have further diversified in the manufacturing of PUF insulated panels which have multiple applications. Rainbow PUF (Polyurethane foam) Insulated Panels have different types of skins such as Pre coated Galvanized sheets, stainless steels, Sheets, Aluminium sheets, Plain Galvanized sheets e.t.c.These panels are separate by rigid foam in place Polyurethane insulation, which adhered to interior of the skin layers providing increased structural strength. All panels have tongue and groove construction of Cam-Lock fastening systems consisting of hooked locking arms on one side and end of panels connected by plastic hook to match log in pins on the other side of the panel. These panels are conveniently assembled at site and the joining and disassembling of the Panels is done by using an Allen key. We are offering wide range of Polyurethane Sandwich Panel that is manufactured from high quality of raw material and advanced technology. This sandwich panel is available in various designs and a range of attractive color to compliment them. Owning to its features, our offered range is highly cherished by our clients. It is tested on various predefined quality parameters to eradicate all quality flaws before its final supply to the clients. This is available in various specifications to meet the diverse needs of the clients at reasonable prices. Rainbow PUF (Polyurethane foam) Insulated Panels have different types of skins such as Pre-coated Galvanized sheets, stainless steels, Sheets, Aluminum sheets, Plain Galvanized sheets e.t.c. and end of panels connected by plastic hook to match log in pins on the other side of the panel. The key advantages of PUF (polyurethane) over conventional elastomers and plastics; it is stronger, tougher, more durable, and more versatile. It's valued above the parts made with other conventional materials which often crack, break, tear, swell, deteriorate, and abrade. As a result, they can interrupt and slow down your business operation. 3. Light Weight, yet inherent strong. 4. Termite proof Anti-mess/fungus, anti-corrosive, Resistance to fire, Detergents, Industrial liquids, Chemical solvents. 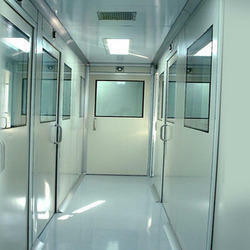 Our clean rooms panel system can be installed as a production complex or a single room for either laboratories or hospitals and can include windows, air locks or pass through facilities. Advanced production technology ensures we meet the clients environmental requirements which can be totally flexible and expanded to at a later date if required. Hinged doors for both freezer and cool store applications Rainbow Doors Team offers a top quality cold room and freezer doors at the best price, with a selection of the most competitive products thanks to their efficiency, quality and innovation. The door construction and fittings are specially designed for the food industry and fulfil the environmental requirements of that industry as well as being able to withstand rough treatment. Rooms with a temperature range between 0°C and -40°C are best locked with an OPI cold room door. The door leaf panels are injected with high pressure polyurethane, leaf thickness up to 150mm, stainless steel finishes are available. The perfect insulation and sealing of the doors prevents the formation of ice and helps to constantly save energy. All doors have a smooth metal surface which can be easily and hygienically cleaned. Prefabricated sandwich panel with polyurethane insulation is the best solution for cold storage units. Formed in place with fire retardant polyurethane using high pressure, CFC-free and use of HCFC 141B technology which results in a superior insulation and construction material. 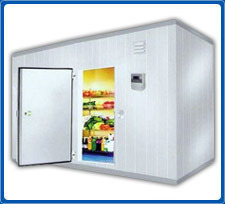 These sandwich panels are design for a fast and easy cold room assembly. rAINBOW cold room sandwich panel comprises of two steel skin (Pre-painted Galvanized Iron Sheet – PPGI) that are bonded with high pressure injected polyurethane foam with tongue and groove joint system complete with cam-locking mechanism. • Rigidly and good weatherproofing. • Twice the insulation characteristics as polystyrene or other thinner insulation panels. thermally efficient and smooth food-safe lining. many years. 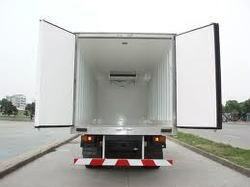 So that our insulated conversions can withstand the constant loading and unloading process involved in daily distribution operations, we have developed a very strong insulated floor, with special insulated wheel boxes which are able to reduce the ingress of heat. OPI can be relied upon to insulate and refrigerate your van so you can transport your goods in a safe and true temperature-controlled environment. A wide range of other optional extras is also available to provide you with the correct fit out for your operational needs. Dual compartments and shelving for example, can be configured to suit your load requirements, including height adjustable, folding and removable options. Pallet slides, compartment divisions and PVC curtains are other key areas that we can tailor to suit your needs. Available in 60/80/100/125/150 and 200 mm thickness. Available upto 1200mm in width and 4mtr,. In length and also in bigger length on special order. The facing of the panels is 0.5mm thick pre coated GI sheets/Aluminium sheets and stainless steel sheets with PE film. The core of panel is rigid foam which is formed by a controlled reaction between two ingredients that is an ISO cynate and a polyol. Manufactured through high pressure injection trusses in automatic hydraulic press. The joint of the two panels is sealed with a bead of silicon. Absolute water and vapour barrier. High durability and very low maintenance cost. Withstand heavy rain/heavy snow and high wind pressure. Withstand extreme cold and hot weather. Have low thermal conductivity which minimizes the rise and fall of the inside temperature. 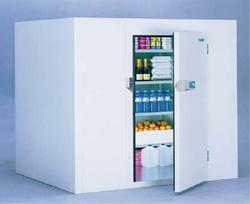 Can be installed quickly and very convenient in shifting from one place to another place. Provide energy efficient and environment friendly solution to building industry.